Click on images for full view in separate window. 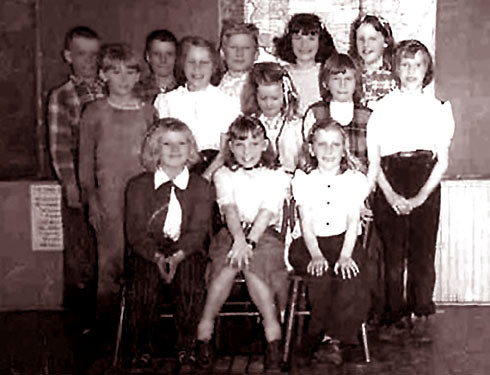 For my second-grade education during the 1952-53 school year, I took a one-year "sabbatical" at the Blair Elementary School, having spent kindergarten and first grade in Hayward. 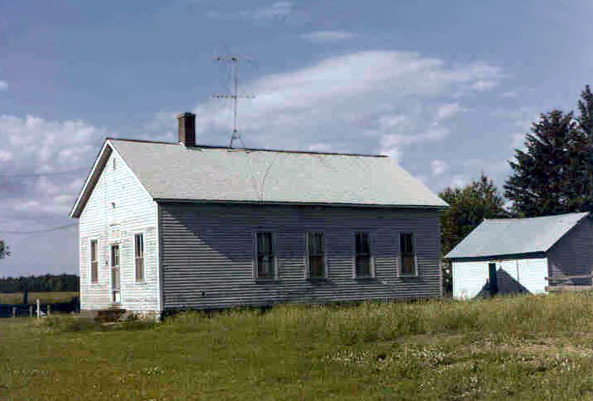 All eight grades were taught in this one-room country school by Mrs. Kathryn Slater who subsequently followed us to Hayward Grade School when Blair's half-century of expanding the minds of the neighborhood kids ended in 1953. Many thanks to schoolmate Chuck Rang for the building and student photos which are linked from the images below. Presently the building is unrecognizable from the photos taken in the early 1950s (Photos 1 & 2), having been completely renovated into a private residence. 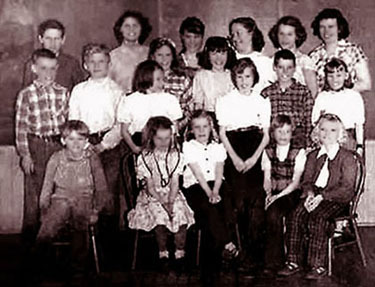 The class photos (Photos 3 & 4) are probably from the 1951-52 school year. Yes, it was all eight grades in one room until about Christmas time when the fifth-grader moved away. Altogether we had at least 25 kids in the room when I attended. We had "cookiedough parties" in the woodshed. Cookie dough was probably brought to one or more of the earlier meetings, and the name just stuck. The main activity would be sitting in a circle and taking turns whispering something in a neighbor's ear which was then passed along full-circle and eventually recited out loud. This was not only highly entertaining but – perhaps not thought much of at the time – also highly instructive as to the inevitable coloration that occurs with the spreading of rumors. We ate a hot lunch daily in the cool, cement brick-walled basement. Chuck Rang remembers that we always ate very well. Winifred Larson, the school chef, would bake bread, pies and cakes for the students and, when provided with turkeys, would always stuff and roast them and turn the leftovers into soup. Chuck remembers a clandestine (and therefore highly enjoyable) hot lunch of snowshoe hare which was killed by one of the kids behind the school with his grandfather's 10-gauge shotgun and then cleaned, roasted and eaten outdoors by some of the students. Periodically we were treated to the chocolate-flavored iodine pills for the thyroid (we called them "goiter pills") – half a pill for the younger kids and a full one for the others. Boys and girls had separate outhouses. Outdoor facilities were the norm for many of us back then anyway. We could not help but "sit in" on what all grades were being taught. As a second-grader, I remember attempting a seventh-grade spelling quiz. Photos 5 & 6 (above) are scans of some notebook pages from around the time I was switching over to cursive handwriting. I remember the 1952 Presidential Election: Adlai Stevenson won with 20-plus votes over Dwight D. Eisenhower who went away with only three. Speaking of current events, the whole group perused and discussed articles in The Weekly Reader the day it arrived in the mail. Outdoor activites included trying to reach record heights on the killer swings and also keeping an eye on the numerous gopher holes that riddled the lawn on the south side of the building. We put on an evening Christmas play that took place simultaneously inside and outside of the building. One of the bits of hard-core science that I learned that year was how raw potato slices turned dark blue when treated with iodine. This is the principle behind the amylase test, one of many tests used in bacterial identification. 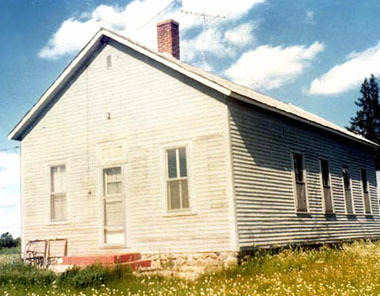 Another one-roomer in the area was Munger School. 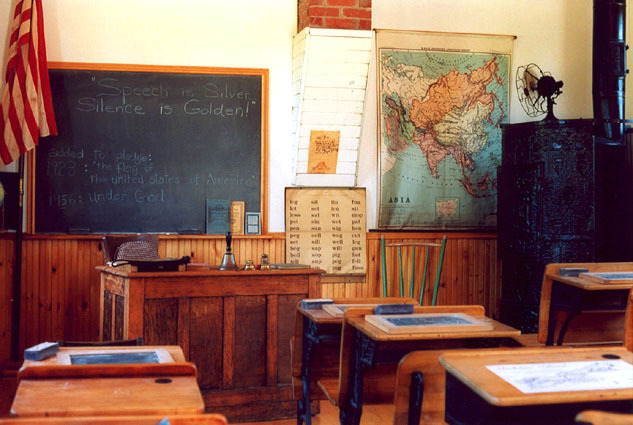 For some reason we thought of Blair School as Harvard, and Munger as Yale. Our field trip at the end of the school year consisted of a long walk to the Namekagon River and back, an event eagerly anticipated by those of us who wanted to find out for sure if there were really trolls under a certain bridge as had been rumored. 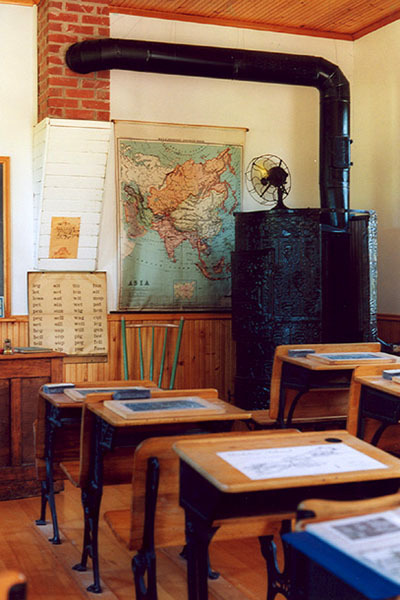 Photos 7 & 8 (above) are of a restored school in the Apostle Islands showing what was probably a typical one-room school interior circa 1930-40. 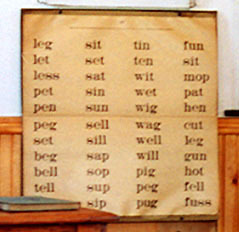 A magnified view of the spelling poster is shown here. For more Northwest Wisconsin history, go to my map site. dairy farm, and his chapter on his one-room country school is here. E-mail me at jlindquist 001 @ gmail.com . Page last modified on 7/21/12 at 2:15 PM, CDT.